SAVA's latest book, based on our 2018 exhibition, is now on sale. active farms.The book closes with a look at the future of farming. welcome all who would like to explore more about Steeple and Middle Aston. 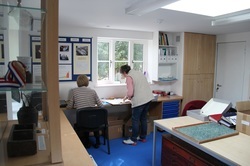 The Centre houses an extensive archive of documents, photos and family history information, maps and other historical material relating to the two villages. It is all available for inspection and further research, mainly free of charge. Please drop in when you can. If you have photos, documents or other material that you think we might like to see, please don't hesitate to visit us - adjacent to the Village Hall in Fir Lane, or contact us.